Restore your silhouette with a Tummy Tuck! If your abdominal skin and muscles are loose from having children or losing weight—or your midsection is simply out of proportion with the rest of you—a tummy tuck can give you a slim, youthful waistline. A tummy tuck, or abdominoplasty, is a plastic surgery procedure that extracts excess abdominal skin and fat, then tightens the muscles of the abdominal wall and tightens and smoothes the area around the navel. A tummy tuck will be slimmer and trimmer not only in the waistline, but all the way from your upper abdomen down to your bikini line. A tummy tuck is best suited to women and men who are in relatively good shape, but have loose abdominal skin and/or abdominal fat that won’t respond to dieting or exercise. If you have borne several children, your abdominal muscles and skin may have been stretched beyond the point where they can return to normal. A tummy tuck might be the answer to getting your pre-pregnancy tummy back. First, your Lift Laser and Body tummy tuck surgeon will make a long, smile-shaped incision from hipbone to hipbone, just above the pubic area. Then he or she will make a second incision to free the navel from the surrounding tissue. Next, the skin is separated from the abdominal wall up to the ribs and lift a large flap of skin to reveal the vertical muscles in your abdomen—the rectus abdominis. Your Lift Body Center surgeon will then tighten these stretched muscles by pulling them closer together and stitching them into position. This tightening process can give you a firmer abdominal wall and a smaller waistline *. Is there more than one version of a tummy tuck? Yes. If your excess fat deposits are only below the navel, a mini-tummy tuck, or partial abdominoplasty may be right for you. In a mini-tummy tuck, the incision is much shorter and the navel may not be repositioned. Your Lift Body Center tummy tuck surgeon will separate the skin only between the incision line and the navel, then stretch the skin flap down, remove the excess and stitch the flap back into place. Are there other alternatives to a tummy tuck? Yes. If you have good skin elasticity and muscle tone, liposuction alone may be used to extract abdominal fat. This alternative may be appropriate for you if you plan to become pregnant in the future *. How fast is the healing process after a tummy tuck? In the months following surgery, it’s important to treat your healing skin with extra care—that means avoiding sun exposure and not wearing black or other dark colors when you are outdoors. Heat absorbed by dark-colored clothing can actually burn your healing skin and complicate recovery. Does a tummy tuck leave a significant scar? Yes. You should understand that a tummy tuck involves an incision that runs from hipbone to hipbone. However, the tummy tuck surgeon at Lift Body Center will place the scar low enough that it will not show, even in a bikini. Bear in mind that the scar will fade with time, but will always be visible. What can you expect from a tummy tuck? 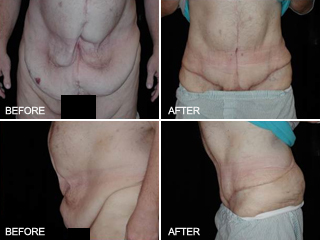 Quite soon after surgery, you can see a noticeable difference in the shape of your body *. Many people find that their firmer, flatter abdomen boosts their confidence and makes them look more attractive in clothing, provided you resume exercise and proper diet. As the months pass, your incision line will continue to fade; however, it’s important to remember that your scar will be permanent. Many patients view this scar as a small tradeoff for their firmer, sleeker appearance. Over time, gravity and aging may cause your skin to loosen somewhat. If this occurs, your Lift Body Center tummy tuck surgeon may suggest additional treatment for restoring a more youthful abdominal contour.